The Lounge Hounds have been rockin' the the Fraser Valley and Lower Mainland since 2008. Singer and guitarist Keith Marr and bassist Evan Duncan came together just after high school with their shared love of original rock & roll, R&B and 60s pop music. Juno award-winning musician Geoff Eyre joined the group as their drummer more recently. Heavily influenced by the pioneering of artists such as Carl Perkins, Johnny Cash, Buddy Holly and Elvis Presley, together the three musicians bring a fresh sense to Rockabilly and deliver a solid punch of lively hooks, high-octane rhythms and finely executed melodies to a new generation of roots rock fans. A talented multi-instrumentalist, frontman Keith Marr cut his musical teeth in a household headed by its own band leader. His father founded The Hornets, an R&B pop act, in the U.K., longer than three decades ago. First in Chilliwack Middle School and then in Chilliwack Senior Secondary Keith, was in the school band. 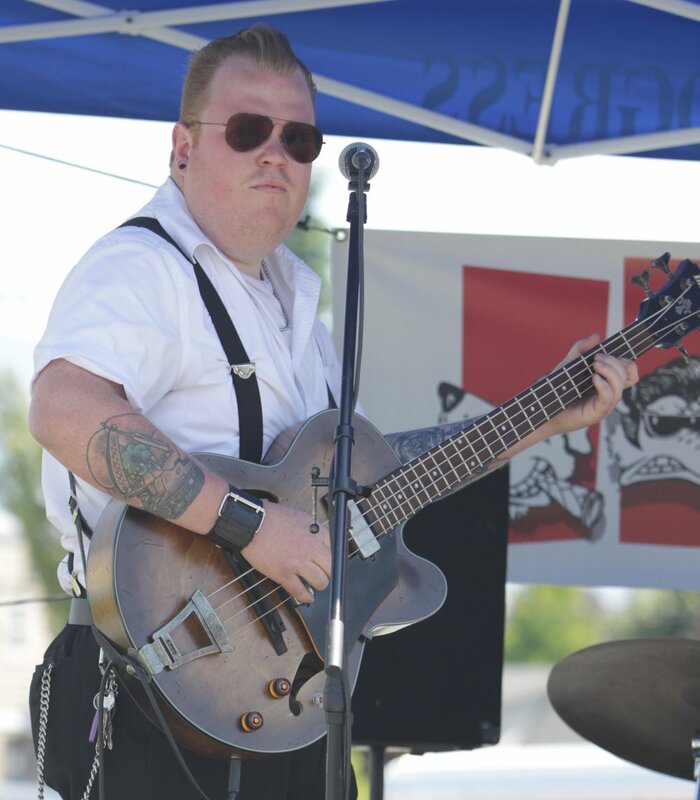 Evan Duncan, who met Keith through work, swings the deep grooves on both stand-up and conventional bass. Geoff Eyre locks it down with steady driving backbeats and adds in backup vocals to fill out the harmony and the sound on stage. Geoff has been awarded gold records for Don't it Make You Feel Like Dancing and Letting Go and a platinum record for the album Turn It Loud. Having extensively toured North America with The Hometown Band, The Headpins, Roy Forbes, The Powder Blues, Straight Lines, and Lisa Brokop, Eyre is a sought-after Vancouver studio musician. The band’s versatility means they can adapt to please their audiences. The music is perfect for swing dancing, mixes well with vintage cars and pin-up fashion, but also works well for those who prefer to sit and enjoy. The Lounge Hounds are available to book for festivals, conventions, clubs, community or private events. Use the contact form below and keep on rockin’ Cats and Dolls!